It is something all bloggers battle with at some point or the other. Some battle with it after a few posts, some after a few hundred posts and others after a few thousand posts. So if you have issues finding topics for your blog, you are not alone. I have more than 500 posts on this blog and hundreds of topic ideas in my OneNote App and elsewhere. So let me share the process that is followed by me to come up with new topics all the time. I have a schedule for a day which is writing early morning and reading in the evening. Most of the time my blog articles are finished even before the breakfast. I prefer reading at night. Many a time I am reading content on my iPhone in twitter for people I follow. If I like something about a topic, I just bookmark it in OneNote. As I am taking the note, I like to keep things as detailed as possible because at times I may not come to that note for months. The notes are not only for the topics but for numerous other things that I intend to do as I am reading and generating ideas or even options I like to experiment or implement. I use OneNote for taking notes and it allows me to share a tweet to my OneNote directly from the twitter App. Apart from that it also enables me to send an email to make a note of anything. I like to keep the process of taking notes as simple as it could be. I am a consultant and as I work for my clients, I am always alert for topics that I think I can write about without violating the NDA of my clients. Apart from working, I am also alert when I am discussing with my peers, partners, or even family members to take a note of topics that I think can be a potential article for my blog readers. Even when I am on a vacation, I take notes about things I can write or I click pictures of potential topics that I can use as topics. At times, I prefer using Scanner Pro to scan papers or documents and keep them as notes in my iPhone that I can refer when I am out of topics or is looking for more topics for my blog posts. 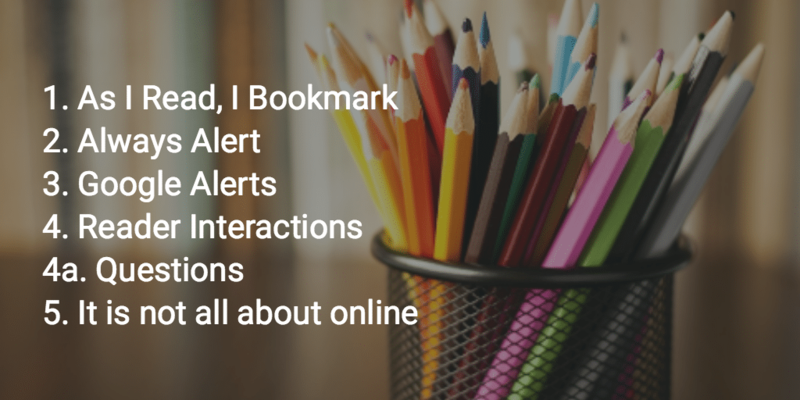 You can just find topics to blog anytime. You can see that I could find blogging inspirations from Sachin Tendulkar which struck me when I was watching TV. Life of great people can be an inspiration to you in many ways and your blog can be no different. Things are being published on the internet at a faster pace than you can ever imagine and so it is impossible to keep up with them. 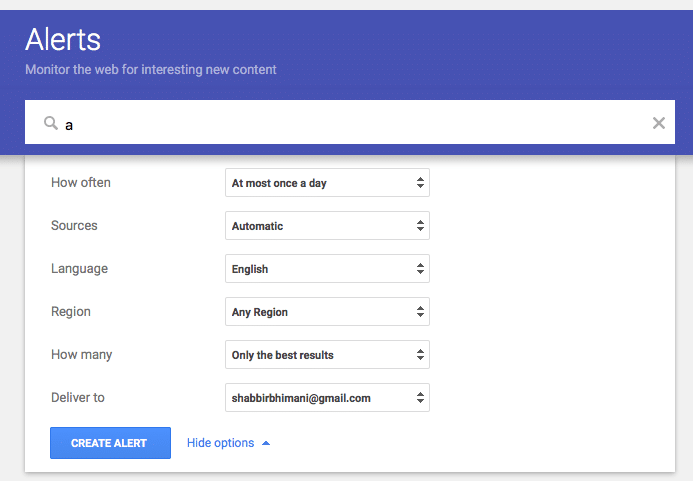 You can either have a daily email of things that interests you as a Google alert so you can read them at your convenience or have a weekly wrap up of things you want to read or if your topic is not something that has too much content being published, just go for an alert as it happens. One of my main sources of topics is my blog readers. I provide multiple points where my readers can interact with me including AMA that helps me to generate topics for my blog fairly easily. They tell me what I should be writing about and it is a two way process where I know what my readers want as well as help me with topics that I can write about. If your blog is not so popular, you may not see too many questions from your readers and so you can use sites like Quora for questions that people ask and answer them as posts on your blog. Apart from QnA sites, you can follow other popular blogs for questions in comments that are being floated to them that you can answer on your blog as topics. We read online, take notes online, keep memories online and blog online as well but it is not all about online all the time. As a writer, I need to replenish my thoughts with fresh ideas and books are a huge source of information. I always have at least one book that is not completely read that I can fall back to whenever I want to. When I am near to complete the books I have on my table, I either go to my re-read list of books or order next set of books from my wishlist. Currently I have 48 books in my flipkart wishlist. The wishlist is updated from the blogs that I read and follow such that whenever someone recommends it; I add it to my wishlist. I would like to add sites like Topsy where you can search for any content and you can have tons of ideas about content that is performing well enough. Agree sites like Topsy or Alltop and other such top ranked content sites can help you generate topic ideas as well. Awesome posts and I didn’t knew you also love reading books. I assumed because there are vert few books you recommend on your blog. Ohh Wow. Yes I don’t review too many books on my blog but I am damn sure it is something I will try doing from now on.